Soooo….put in a new range this weekend. Couldn’t just buy a gas line to hook it up…had to buy a “kit”. 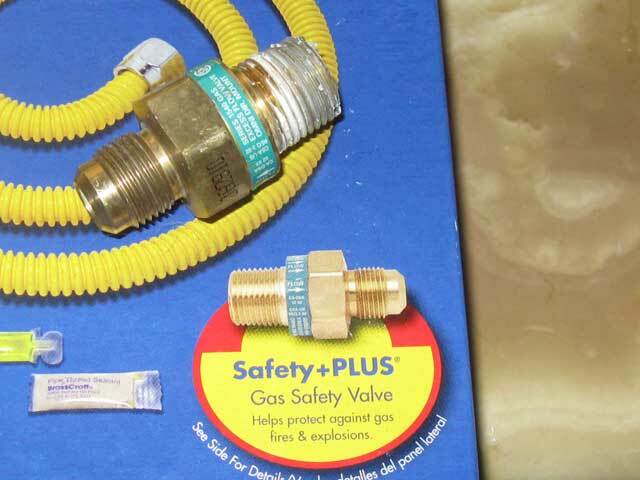 Well, no matter what I did, what I tried, or how slow I did it, when I turned on any part of the stove the “safety” valve cut the gas off. Very safe, you see. If you can’t get any gas at all out, well, you’ll never have a gas fire will you? Somebody designed this. Somebody packaged this. Somebody marketed this. Somebody sold this. This doesn’t work. Useless all the way through. The time and money expended…over and over and over again…so sad. It’s part of that trend, you see…slap the word “green” or “safety” or scream, “Won’t somebody please think of the children!” and it sells…and is probably “required” in some places. Note that this is part of the “hookup kit”, not a part of or sold by the company that made the stove. So, I had to chuck the valve. That meant that it took me twice the work and time to install the stove as it should have, the expensive kit didn’t have all the fittings I needed (I lucked out and had the missing one) but hey, a small price to pay for safety, right? Would have been cool if it could work. I can’t even imagine what it could work for! “Excessive flow?” Well, “excessive flow” would have to be “more than the stove could need if everything is on”, and that would be about as much as the line can pass at standard pressure. So, maybe, if somebody gets an ax, pulls the stove out, and cuts the flexible plastic-coated-steel line (you won’t break it by pulling on the stove), maybe it would do something. Any smaller leak is just going to appear to the valve to be the stove itself, and I think we’d hear the screaming and gunshots if a guy with an ax was trying to assault our stove anyway. But now, you see, I’ve changed the kit, so of course I’m responsible for the results, which is bad for the guy with the ax, but pretty much irrelevant to anything else. And the results are…we can cook with gas! (no leaks).